The last audiobook I reserved at the library turned out to be 30 hours long with 30 discs and a 2 week check-out time. I brought it back without opening it, as I didn’t want to import all the discs and I knew I wouldn’t have time to get it done. My TBR list never gets smaller, so I thought I could maybe knock off one book per month this way. I miss listening to books, so it will now be more intentional! 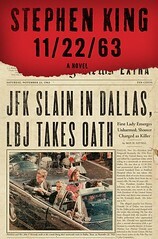 First book I downloaded was the one I returned to the library – “11.22.63” by Stephen King! I have heard good things about it, and so far so good! Do you have favorite audiobooks? It is audiobook month, after all – let’s discuss! This entry was posted in General Book Talk, Mondays and tagged 11.22.63, Audible, Audible.com, Audiobook, commute, narrator, Stephen King. Bookmark the permalink. The audio-books for Star Wars are actually really well done with sound FX and music to enhance the mood. I listen to them while I do the dishes. But then, I’m a big geek. Terry Prachett is another favorite in audio-book form because all the notes are integrated into the main text. I don’t read much in the fantasy genre so haven’t read or listened to either the Star Wars books or Pratchett books. I have enjoyed some audioboks that included sound effects – I think I listened to a Sherlock Holmes book and a Wooster and Jeeves book which had sound effects. Also a memorable version of The Glass Menagerie done in the play format (ala radio play). King is truly a master storyteller. It has been a long time since I have read one of his novels – but I was instantly reminded why I have always loved his books. The characters leap from the pages, fully formed and believable. Despite this being a time-travel book, something which is clearly outside reality, I found myself firmly believing the premise. And this is what King does best – he engages his audience, takes them places where they might not travel themselves, and convinces them this could happen.